The lively music of a polka or lingering smell of stale beer still can bring to mind the dance hall my father, August Angel, owned from 1953 until 1964. Located at 19 North Second Street, the building was directly across the narrow alley from our family’s apartment and my dad’s printing business. Quite large in size and covered in beige and black faux-brick asphalt sheet siding, it wasn’t the most attractive structure in town. But in spite of its unassuming appearance, this building was a highly popular community center for over a decade. In the 1940s, the building had been a popular skating rink complete with rental skates and organ music. It was owned and operated by Mr. Hanlon, who lived in an apartment above the hall and also owned several other properties in the area, including Shady Grove on the Sharpsville-Greenville road and land in Hickory Township (now Hermitage) that he eventually sold to DeBartolo Corporation, a builder of shopping malls. Before the turn of the century, it housed the town’s livery stable. When automobiles became an affordable, convenient, and fashionable mode of travel, the “hay burners” were abandoned…. Likewise, the need for a livery stable ended and the building was used for other purposes. Logo of Sanborn Map Co. on map of Sharpsville, PA, 1895. The Sharpsville Area Historical Society site has a link to a collection of Sanborn Maps of Sharpsville from the Library of Congress. These maps were among many prepared by the Sanborn Map Company from New York to assess fire insurance liability in urbanized areas in the United States. Founded in 1866, Sanborn is still in operation, currently offering “geospatial solutions and technology.” One of the maps, dated 1895, (Sheet 4), shows a livery stable on North Second Street in the same location of the building of Dad’s description. The building is depicted as a skating rink in 1905 (Sheet 5). The 1912 map (Sheet 10) shows that house no. 30-31 was used as “carriage & painting 1st [floor], table varnishing, 2nd….” Next door, house #31 held a mattress and table store. Since I could afford it, I bought the Sharpsville building, although it was on an impulse. I had no immediate plans for what I would do with it. My parents immediately went about cleaning up the hall, and over the first several years, gradually remodeled the structure. The restrooms were modernized, an annex containing a commercial kitchen was added, a bar area was built at the far end of the dance floor, the windows were replaced, and, in 1954, a neon sign was installed when the name of the hall was changed from “Hanlon’s Hall” to “Angel’s Casino.” Also, during the revamping, my father added a green canvas canopy that stretched from the front door to the sidewalk. In my young eyes, this was a very swanky touch. For years the community had misgivings as to whether it was good or bad for Sharpsville. Two of the most vociferous complaints were about the traffic jams the social gatherings created and the influx of strangers, especially youth, into the previously close-knit community. However, traffic and parking problems were brought under control and the neighborhood became accustomed to strangers. My rental business created ripple effects in the form of substantial profit increases for businesses and more jobs for residents – especially as extra duty security personnel. Also, the Casino was in a central location that large groups of people could easily access, unlike meetings in church basements, school lunch rooms, or auditoriums. And in time the dubious name “Casino” was seldom used and “Angel’s” was the catchword for the building. Some of the building’s decor was left over from its skating rink days, such as the rows of fading crepe paper fringe that hung from each rafter overhead, an old upright piano, and a Wurlitzer jukebox full of 45 rpm records of 1940s music. When in operation, its frame of neon columns would light up in dazzling orange, yellow, and green. 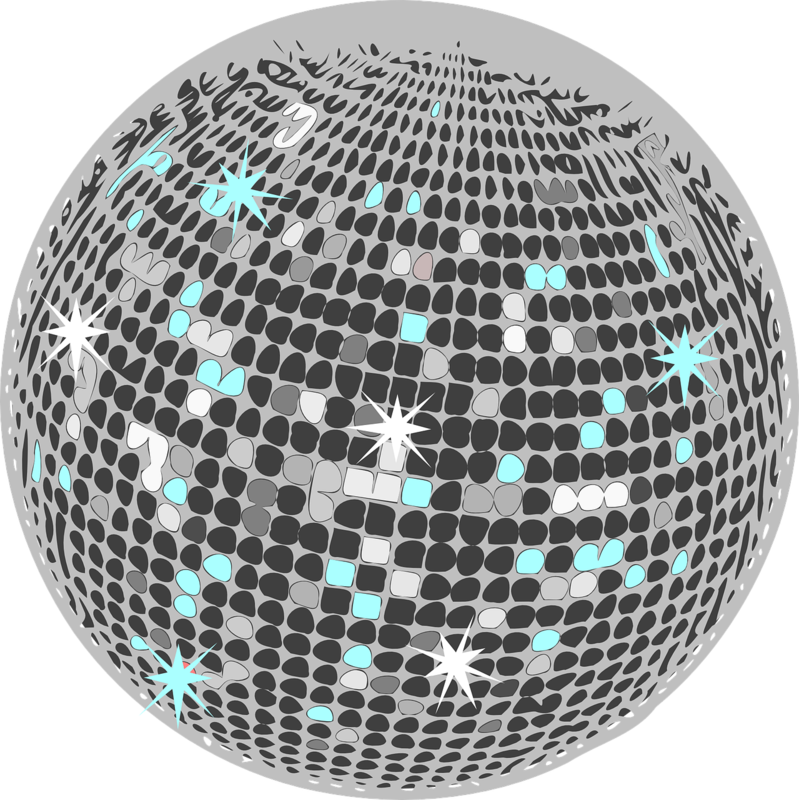 My favorite item was the mirrored ball suspended from the ceiling in the middle of the dance floor. Confetti-like bits of color would reflect on the guests and floor, creating a magical and romantic mood when a ballad was playing and the lights were turned down low. M y parents often supplied the hall with second-hand items they had purchased from other establishments that were selling off their equipment. The wooden folding chairs came from Woody Wooddell, a locally well-known “hillbilly” singer and disc jockey on Sharon’s WPIC and other radio stations in the area. A stove, working table, french fryer, and other items were purchased from the owners of the former Welch House Hotel on Fourth and Main streets, that had burned down a year before. Most of the dishes, silverware, and cooking utensils in the kitchen were obtained at a bargain price when the U.S. Army Camp Reynolds, located midway between Sharpsville and Greenville, was closed after WWII. I was intrigued by the thought of hapless German prisoners eating from the same plates we now owned. For several years a family of four rented an apartment in the front half of the upper level of the building. 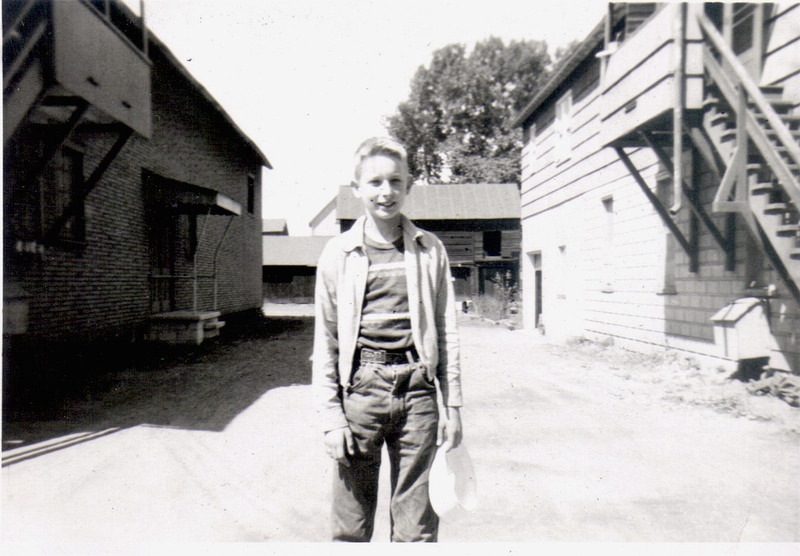 The older of the two little boys often joined the gang of kids who played hide-and-go-seek, baseball, or cowboys and Indians on North Second Street. On Sunday afternoons, their mother would sit on the porch at the top of the stairs to their apartment and watch us play while she listened to a radio program of Croatian folk music. Her washing would hang on a clothesline that stretched across the alley from their upstairs porch to ours, operated by use of a pulley. After several years the family relocated to a house on Ridge Avenue and the hall’s upstairs rooms and kitchen were reconfigured to provide small dinners for local civic groups. The other half of the hall’s second floor consisted of a large attic-like storage area. 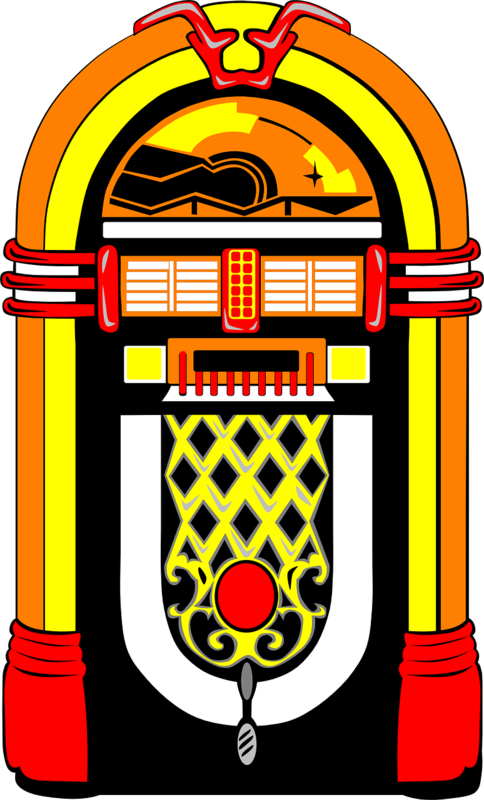 I sometimes poked around in that dusty, cobwebby space because it held odds and ends from the past, such as piles of rusted skates with moldy leather uppers, old 78 rpm vinyl records (mostly organ music), storage trunks, and an old-fashioned sleigh. When my father purchased the hall, gave it a new name and began to develop a new identity for it, he could not have imagined how well-known it would become due to the major new genre in popular music. — Ann Angel Eberhardt (SHS 1958), Goodyear, Arizona, April 2013. Excerpts from “Trivia & Me,” (1996) by August D. Angel. 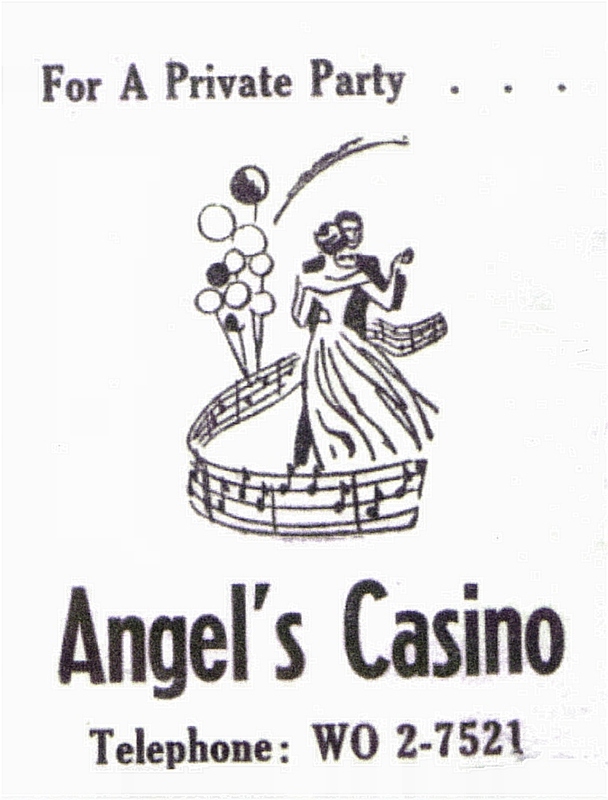 Angel’s Casino, Sharpsville, PA. Photo by Pat Angel, c. 1976.